It was known already known that new manufacturers are entering the FIA Formula E Championship in the following seasons but FIA officially confirmed the full list of manufacturers that will homologate cars from the sixth season (2019-2020). The latest additions are two German car-making giants Mercedes-Benz and Porsche. They will join the party from the sixth season, a year after BMW and Nissan would enter the electric racing competition from season five (2018-2019). That brings the total number of manufacturers to 11. Those eleven manufacturers will have a two-year homologation period before the next cycle begins for the 2021/22 season. The manufacturers are Audi Sport, BMW, DS Automobiles, Jaguar Land Rover, Mahindra Racing, Mercedes-Benz, NextEV NIO, Penske Autosport, Porsche, Nissan and Venturi Automobiles. The season five, which begins in late 2018, marks a crucial step for the championship because the faster and more efficient FIA Formula E Gen2 cars will eliminate the need for a mid-race car swap. “The future landscape of the ABB FIA Formula E Championship is growing more and more, and today as we confirm two additional manufacturers for the sixth season we have more evidence of the success of this concept. Mercedes-Benz and Porsche are both brands with long and decorated histories in motorsport, and the level of all of the 11 manufacturers that will take to the track from 2019/20 is very high. Formula E is going from strength to strength, and the commitment of manufacturers to sustainable racing technology is very encouraging,” FIA President Jean Todt said. “I’m delighted to see both Mercedes-Benz and Porsche alongside some of the existing names on the official list of homologated manufacturers for season six. We continue to exceed all of the initial expectations set out when we started this journey just four years ago. If you had said to me then that we would be in double figures in terms of recognizable names in the world of motor sport, biggest road car manufacturers and automotive brands – I would have said you were crazy. But this is the reality now. 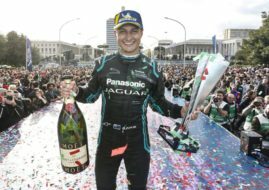 Combine this with the ever-growing list of partners joining the electric racing revolution and it’s clear that the ABB FIA Formula E Championship is a very exciting place to be in motor sport,” Formula E Founder and CEO Alejandro Agag said.